Want to Develop Leaders in Your Church? Use the NAMB/NOBTS Multiplication Pipeline! In order to see a multiplying church planting movement take place, there must be a pathway for churches to discover, develop, and deploy church planters and church planting teams. Currently, we have more resources available than planters and planting teams to send. There has never been a greater time for churches to think strategically about raising up church planters and church planting team members. Over the last two years the North American Mission board has been working to develop and make available resources to help churches raise up leaders from within. The hope is that through discovering leaders and developing them, churches would be able to deploy teams of missionaries locally, nationally and globally. The Multiplication Pipeline is a resource to help your church discover, develop, and deploy disciples who make disciples. Having used it for the last two years, I cannot be more impressed with the content, ease of use, and results of the Multiplication Pipeline. It is a game changer for a local church serious about raising up the next generation of leaders. The Multiplication Pipeline is designed to train potential church planters, church planter team members, and missional leaders! This will benefit any church looking to develop missional leaders within a local church context. Through this pathway, our hope is that churches discover their own missional leaders who could be catalytic in creating a culture of disciples who make disciples, or be future church planters and church planting team members to be sent out across North America. The Training has 3 levels that will help the student develop more in areas such as spiritual formation, biblical knowledge, missional living, missional leadership, disciple-making, church planting call, models of church planting, etc. You can download user guides on the Multiplication Pipeline to review content. The North American Mission Board is thrilled to not only have a resource like the Multiplication Pipeline but to be in partnership with the New Orleans Baptist Theological Seminary to offer course credit hours for undergraduate and graduate students going through the NAMB Multiplication Pipeline. Don’t miss out on a tremendous opportunity to advance your education as you prepare for your ministry calling. When I first moved to New Orleans, a couple of church planters invited me to a Mardi Gras parade. A little surprised and uneasy, I said I would check with my wife. My idea of Mardi Gras was what I had seen on T.V. and it would make any pastor blush. What I learned, however, was that there was a very different story to Mardi Gras with the residents of New Orleans. Although Mardi Gras can be traced back to European medieval times, historians believe that the first American Mardi Gras took place on March 3, 1699, when the French explorers Iberville and Bienville landed in Louisiana 60 miles downriver of New Orleans. Realizing it was the Eve of Mardi Gras, they held a celebration and named the spot Point du Mardi Gras. In 1703, the tiny settlement of Fort Louis de la Mobile (Mobile, Alabama) celebrated North America's very first organized Mardi Gras. 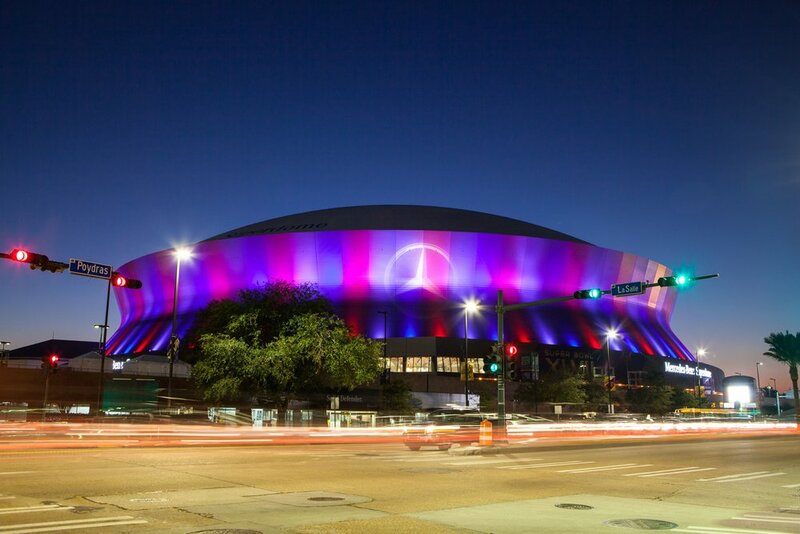 New Orleans was established in 1718 and by 1730 Mardi Gras was openly celebrated in the city. In the years that followed, as New Orleans was transitioning between France, Spain, and finally the United States, the city began marking the holiday with much more emphasis and pageantry. Krewes (organized private clubs) began electing a Rex (a carnival King), assembling street parades and hosting masked balls and festive dinners. Mardi Gras and Carnival are the same celebration. The Carnival season actually begins on Epiphany, a Christian holiday celebrated on January 6 that remembers the three Wise Men bringing gifts to baby Jesus. Mardi Gras is technically “Fat Tuesday,” the day when everyone practices overindulgence before Ash Wednesday, partying before repentance. The feast before the fast. Ash Wednesday marks the beginning of Lent, a 40-day season of fasting leading up to Easter. As part of New Orleans' Orthodox Christian tradition, the coming of the Wise Men bearing gifts to the Christ Child is celebrated twelve days after Christmas. This marks the beginning of Epiphany. A popular custom was and still is the baking of a special cake in honor of the three kings, called "A King's Cake." 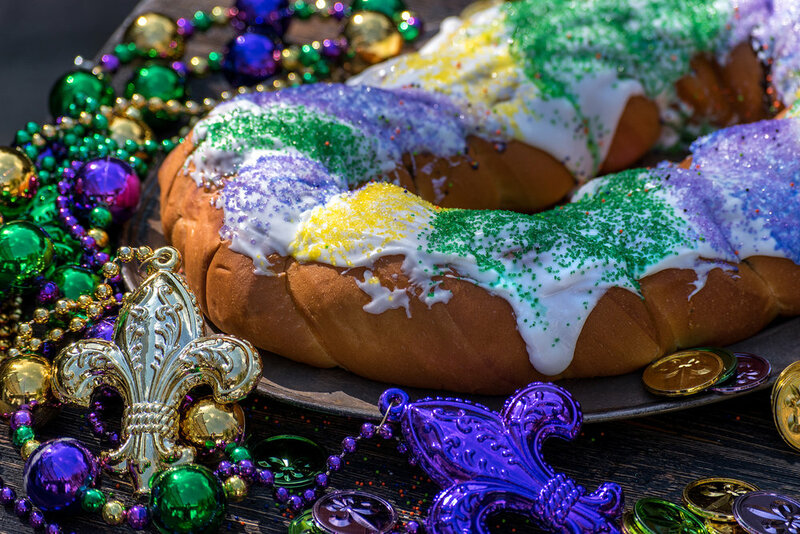 From the beginning of Mardi Gras season, Jan 6, until Ash Wednesday you will find traditional King Cakes in homes, offices, and shipped all over the world as gifts. Today during Mardi Gras, parades are all over the city and are virtually non-stop. Louisiana is the only State that has an official “Mardi Gras” Holiday. Many of the parades are neighborhood celebrations with entire families participating. Only during Mardi Gras can you catch beads, plastic gold doubloons, vegetables, purses, shoes, and coconuts during a parade. Mardi Gras has more than just historical ties to New Orleans; it generates a tremendous amount of revenue for the City. Currently, an average of 1.2 million visitors attend Mardi Gras Celebrations. The direct economic impact is approximately 840 million dollars annually. My perception and understanding of Mardi Gras has completely changed over the last six years. Generally speaking, in New Orleans there are two crowds participating in Mardi-Gras: those who tend to participate in the more provocative parades New Orleans is famous for, and those who tend to participate in community and neighborhood parades that are more family friendly. Life in New Orleans is really one long season of celebration, but Mardi Gras is the climax of all celebrations. This season of celebration and fasting is a great reminder of the greatest Ash Wednesday ever, the day Christ took on sin at Calvary, removing our guilt and shame once and for all. There can be no greater celebration of this truth than the resurrection of Jesus! Join me in praying for the many residents of New Orleans this Mardi Gras season. Pray they see past religious traditions that do not save and see the living hope of the gospel that brings new life. That is a reason to celebrate! If you are looking for more fun facts hand history about Mardi Gras or you just want to order a King Cake, check out these links. College Students: Don't Waste Your Summer, Come to New Orleans! Gen Send New Orleans is designed to be one of the most, intense and unique student missionary experiences in North America. It immerses young adults into a context where they gain practical knowledge of the realities of missions and leadership for 7 weeks. Applications and being accepted and interviews are underway, don’t waste your summer, join us in New Orleans for one of the most life changing opportunities of your life! Apply today at Gen Send Summers. Attached is a blog post from this fall that details a little about what last years team accomplished in the city as they identified two future church planting locations for Send New Orleans. It is that time of year, time to reflect on and evaluate the passing year and look forward toward the new year. December is the month where my family and I take our yearly Gospel Life Plan retreat. These are some of the sweetest times we know as a family. Over the course of a few days, we look back at our goals and plans for loving God, leading well, and living the gospel. Joy and I are blessed to spend time individually with our kids reflecting on what it means to be a disciple of Jesus. This time is also an opportunity for our family to separately and corporately set new goals for the coming year. Gospel Life Plan retreats have allowed us to grow closer as a family, see God's gracious fruit of the gospel, and challenged us to pursue Jesus with greater passion and affection. You can download the Gospel Life Plan Worksheet and resources by clicking the link below. The resources below are essential in getting the gist of making a gospel life plan. I want to encourage you to not waste your life. Don't miss out on an oppurtunity to commit your life and year to loving God, leading well, and living the gospel as you and your family manifest God's kingdom here on earth. These resources include: GLP Terms Sheet, Gospel Life Plan Grid (blank), and Gospel Life Plan Grid (example). There are three primary areas I believe every christian should set goals in; loving God, leading well, and living the gospel. Each year our family sets goals that flow out of these three spheres of life. This is a great way for us to stay focused on spiritual disciplines, cultivate a healthy family, and live out a missional life. This has become one of the most beneficial ways our family has grown together. 1. Communication- Our family has cultivated some great communication during these times. I am amazed at how much closer we become when we stop long enough to listen and talk to each other about our family and life. 2. Intentionality- There are 168 hours in a week. If you sleep 8 hours a day that leaves you 112. What are your priorities? You will either AGONIZE or PRIORITIZE! Each year our family is challenged to set our priorities, we simply cannot do everything. Prioritizing our values and time changed our lives and keeps us intentional about the most impotant things! Everything cannot be a priority. You can’t have it all. Everything should not be a priority. All things are not created equal. Some activities and investments are more important than others. Some activities and investments are more lasting than others. 3. Growth- Joy and I will celebrate 16 years of marriage at the end of December. Over the last 8 years, we have seen our greatest growth together as a couple and a family. It was during this time Joy and I began intentionally setting goals for ourselves and family in the area of loving God, leading our family, and living the gospel. We say loudly and often, there is NO perfect family and we have no goals to try to be one! We do however have a perfect Jesus who has made us righteous, and He is worth pursuing with all hour heart, soul, mind and strength. Goal setting for God’s glory is an honorable pursuit, we hope you join us! 1. Love God- These goals should focus on spiritual disciplines, identifying idols, repentance, fruit, and community. Spiritual Disciplines are a means of sanctification and our sanctification is the will of God. 1 Thessalonians 4:3, For this is the will of God, your sanctification…As Christians we should set goals to read and memorize the Word, examine our lives, and pray earnestly. Without spiritual disciplines we will not grow in Christ-likeness and we will not deepen our love for God. Idols in our life are the primary reason we fail to love God. As you identify idols and demonstrate godly repentance, God graciously allows us to see fruit in our lives. How do you know you have truly repented of an idol? You will have a corresponding fruit! Part of loving God and Christ is loving the Church. Jesus is the Bridegroom and the Church is His Bride, Jesus loves His Bride. Part of loving God and growing in our relationship with Christ is loving His Church. Don't forget that corporate body life is a spiritual discipline, along with reading the Bible, praying, fasting, and scripture memorization. 2. Lead Well- Every Christian has the responsibility of leadership. Your leadership platform is shaped by age and season of life. Goals for leading well should flow from your role (husband, wife/mom/student/single adult/etc), seaons of life, and current leadership platform. Gospel courage and gospel confidence are essential for leading well. Gospel Confidence is the fruit of our identity in Christ. Gospel Courage is the action from our identity in Christ. Setting goals in leading well for the glory of God is important; your life, marriage and family are a witness to a watching world. 3. Live The Gospel- These goals should focus on disciple making, personal evangelism and missional living. I heard another Christian leader once say, "If you tell me your a follower of Jesus and your not helping other people follow Jesus, I just don't know what you mean." If you are Christian you are called to make disciples, this is not optional. I cannot count how many christian men over 35 I have encountered that say one of two things: 1. I have never been discipled, 2. I have never discipled another person. What a tragedy! It should be the goal of every christian to be intentionally discipling others to follow after Christ. Personal evangelism is an intentional explanation of the Gospel and genuine appeal to repent and believe. Pray earnestly for God to cultivate a brokenness for lostness in your life and challenge yourself by setting some goals to be intentional about sharing the Gospel. Missional living is where we embody the character of Christ and the mission of Christ through the Spirit of Christ, for the glory of Christ. We see the world through the eyes of Christ. Setting missional living goals will mean getting involved with the least of these. The broken, hurting, poor, abused, used, orphaned, and oppressed are not only around the world, they are across the street. Missional living is an intentional way to be the hands and feet of Jesus for the glory of God. This is a passion for my family and I, If I can serve your your church do not hesitate to reach out gross@namb.net. 2. Pray for church planters and their families as they are on the front lines of pushing back lostness in the midst of intense spiritual darkness. New Orleans has a long history of being a very spiritually dark place. This is a real battle felt by planters and pastors across the city. Pray that the city “that care forgot” will be transformed by the gospel of Jesus Christ. 3. Pray for efforts to discover, develop and deploy church planters across New Orleans and South Louisiana. Pray specifically for our work with New Orleans Baptist Theological Seminary (NOBTS), as we are implementing the NOBTS/North American Mission Board Multiplication Pipeline to assist us in developing new planters and team members. 4. Pray for us to mobilize more churches to partner with Send New Orleans through prayer, participation and provision. We would like to see every church plant with multiple support partners that are committed to the planter and the city. 6. Pray for the intentional efforts to cultivate awareness to the incredible hardship and sacrifice that planters encounter in New Orleans. Currently, we have the dubious distinction of having one the largest per-capita violoent crime rates for a U.S. city. 7. Pray that we will effectively engage in the fight against poverty though our partnership with Send Relief. New Orleans has the largest population of children (39%) living in poverty in the U.S. and an overall poverty rate of 27%. 8. Pray that we will find covocational church planters with high capacity leadership to plant churches in New Orleans. These planters intentionally serve in a career outside of the church while also serving as the planter of a church. 9. Pray for New Orleans church planters and their families by name. Find their names and locations by exploring the map found at www.namb.net/send_city/new-orleans. Spiritual formation is an intentional, multifaceted process which promotes the transformation by which Christ is formed in us so that we can become His continually maturing disciples. Christian spiritual formation is the journey of growing into maturity in Christ, as we are conformed to His image and live out His mission. A person’s spiritual formation affects every area of their life and ministry, think about that? Every area of life and ministry. Without the intentional pursuit of spiritual formation, you forfeit the power and presence of Christ in your life and ministry. Leadership will flow out of your power and strength, instead of His power and strength; resulting in discouragement, defeat, and possibly destruction. This is why ongoing spiritual formation is more than a competency, it must be a deliberate pursuit. Jesus answers the scribe’s question of what is the most important commandment, “And you shall love the Lord your God with all your heart and with all your soul and with all your mind and with all your strength.’” (Mark 12:30, ESV) This all-encompassing heart, soul, mind and strength love should be a relentless pursuit in the life of the Christian. Cultivating daily solitude as you spend time in the Word and prayer are essential for deep relational intimacy with Christ. Pursuing intimacy strengthens our identity in Christ, and guards us from finding our identity in ministry. We find confidence in our righteous position and courage for our ministry calling as we deepen our love for Christ. 1. How would you currently describe your journey of spiritual formation? How are you taking responsibility for spiritual formation in your personal life and the life of your family? 2. You cannot love God with all your heart, if you heart belongs to someone or something else. Whatever you love the most you choose the most, the more you choose it the more you love it. What is it that you love most today? 3. Solitude is a catalyst for intimacy. Inability to cultivate solitude, manifests the rule and reign of busyness or laziness; and conveys a deep problem within your soul. What is your discipline for daily solitude in word and prayer? 4. Authentic accountably gives someone permission to adjust your self-perception and call you to be like Christ as you pursue obedience and holiness. Who do you consistently have accountability with? Do they have permission to adjust your self-perception? Do they really know you? Are you honest with one another concerning issues of obedience and holiness? Kenneth O. Gangel and Jim Wilhoit, The Christian Educator’s Handbook on Spiritual Formation (Wheaton, IL: Victor Books, 1994), 16. Send New Orleans is actively praying Luke 10:2 for neighborhoods and communities in New Orleans that are in need of a gospel witness. Realizing the greatest way to impact a community is through evangelism, disciple-making, and church planting, we are praying for passionate church planters and kingdom-minded partnering churches to adopt one of our top 5 specific locations in New Orleans to plant a church. Summer of 2018 saw sixteen college students move to New Orleans for seven weeks to serve in with Gen Send. The North American Mission Board Gen Send program brings college students from across North America to urban cities in the Send Network. College students spend seven weeks working with the city missionary and church planters to learn, contextualize, and map neighborhoods that are potential locations for future church plants. Gen Send students are trained to use the book Tradecraft to compile missiological data and community information. The 2018 students did an outstanding job of providing a prospectus for the Audobon and Feret Uptown area of New Orleans. Their prospectus, included below, includes a trove of contextual data and missiological information that will help the next church planter and sending church considering this area of New Orleans. If you would like more information about Church Planting in New Orleans email George Ross at gross@namb.net. I never wanted to move back to New Orleans. It was truly a supernatural move of God. Moving back to New Orleans to be a church planter was special, but different. I have family there, but moving there as a missionary felt more isolating than I thought. New Orleans is an isolating city for church planter. It’s a tough city to plant in and reach people. We can’t be isolated as planters and have to continually fight the urge of thinking we can do it all by ourselves. That is why brotherhood is so important. Brotherhood looks like a phone call you can make at any time of the day or night to talk through a tough situation. It looks like life-giving conversations over countless cups of coffee. Brotherhood is having a friend you can go to for anything. I have friendships with guys who have talked me down off ledges and poured into me so much. They have been people I can trust — people I can share the reality of my life with and receive genuine feedback and real care. Having this brotherhood has been such a blessing. We share our victories and struggles with each other, and then we are able to celebrate or help each other work through our challenges. I recently read that it is essential for planters to have relationships with other church planters. When we have other church planters we can talk to, our success rate is higher because we are not alone. Here are my top three reasons why brotherhood, especially with other planters, is so important. It can be easy to be prideful and just be on your own in church planting. It can be hard to let others in because you don’t want them to see your weaknesses. That is a fear we have to look past. The good in having others see your weaknesses is that they can speak into your life and help you grow. When you are surrounded by a community of people pursuing the same thing as you, it creates a network of encouragement. If you have one or two guys you can turn to, you can say you have people who can hold your arms up. Much like Moses, we need these people. That is what brotherhood is. That takes times to cultivate, but it is invaluable. I didn’t come from a Southern Baptist background so I didn’t know about Send Network until three or four years ago. When I saw that their values were kingdom, brotherhood, and multiplication, I knew they were the network for me. I wanted to be a part of something bigger than myself, and Send's vision allowed for that. Leadership is lonely. We need brothers who are in the same boat as us, so we understand that we are not alone. With the Send Network, even if we aren’t in the same place, I know I have brothers all over North America who can pray for me and encourage me. They also can give me their raw opinion on how my sermon went and how they think the church is doing, and I won’t get offended because I know they only want to see God do amazing things through me. The brotherhood I have experienced has truly been a unique bond, and I don’t know where I would be without it. When people forsake the call to engage in brotherhood, they are missing out and allowing room for the enemy to sneak in and wreck their ministry. Our Send City Coordinator, George Ross, has helped us foster a healthy brotherhood. I connect with my brothers a minimum of once a month, but usually more often. Our brotherhood has expanded and is pushing the kingdom even further. I see the work God has done in my brothers’ lives, and it is an extension of all God is doing in my life. If you would like to find out more about Ryan Rice visit connectalgiers.com. Understanding the gospel is key to having gospel awareness. The Life Conversation Guide used by the North American Mission Board is a great resource that plainly and clearly explains the gospel. Starting at God’s purpose in design and ending with the promise of the gospel, we are reminded that there is hope amid our brokenness. Gospel awareness is the intentional understanding of how the gospel intersects self and life. The death, burial and resurrection of Jesus Christ are the foundation of gospel awareness. The gospel does not just save us; the gospel is saving us. The goal of gospel awareness is to cultivate a reliance on the gospel that protects us from being performance driven, self-reliant, and captivated by idols. Growing up on a dairy farm was a unique life only a handful of people are blessed to experience. My dad named almost every cow we owned. Their names would express an outward characteristic (Blaze) or a personality (Crazy). I remember watching with amazement cows walking up to my dad as he called their names. Not only did he know their names, but they knew his voice. Only through time spent with cows was this feat possible. Gospel awareness becomes something caught when we spend time with God, learning who He is and obeying His voice. Having God-awareness requires we cultivate habits in our life where spending time with God in His Word is as natural and consistent as breathing air. My gospel-awareness is directly connected to my devotional life as I pursue an intimate relationship with Christ, and am renewed daily with the beauty and wonder of the gospel. Habits are inescapable, the question is, are your habits serving your well or serving you poorly as you grow in gospel awareness? Gospel awareness will be manifested in healthy self-awareness. Self-awareness is defined as conscious knowledge of one's own character, feelings, motives and desires. Throughout the early years of my church first church planting experience, I was plagued with a pervasive lack of self-awareness. I demonstrated leadership actions that were neither shepherding nor Christ-like. Blind to how others perceived my leadership and life, I was incredibly emotionally immature. Gospel awareness is caught when our spiritual maturity manifests itself in emotional maturity. We grow in our self-awareness and refuse to lead and act in a way that is contrary to the gospel. When our motives are driven by fear, anxiety and anger, we leave a wake of hurt people and broken relationships. Gospel awareness calls us to evaluate our motive and leads us to deal with our emotions in view of the finished work of Christ. Authentic accountability is essential to self-awareness. Who has permission to adjust your self-perception and bring gospel awareness to your life? Gospel awareness will guard against finding our identity in performance. Paul Tripp writes in Dangerous Calling, “Ministry is not our identity, it is our calling.” For many pastors, myself included, this is an all too real battle. If your ministry is your identity and not your calling, as ministry goes will be as you go. When ministry is good, you will be good, when ministry is bad, you will be bad. As you well know, this is a miserable way to live; gospel awareness points us to a better life. Gospel awareness is caught when our performance no longer defines us; Christ defines us. Through our God-awareness and self-awareness we are reminded that even as broken and mistake prone as we are, we are loved with a fierce and forever love because of Christ. The gospel points us to the perfectly righteous performance of Christ on the cross; we no longer are driven by failure, approval, or expectations. We are motivated to action because we are approved, accepted, and gloriously adopted. Gospel awareness keeps us from living a miserable performance driven life and calls to the joy of living a God-glorifying life. If your greatest disappointments reveal misplaced affections and identity in your life; where are you currently getting your identity? Reggie McNeil says, “The single most important piece of information a leader possesses is self-awareness.” Self-Awareness could be defined as a conscious knowledge of our own character, feelings, motives, and desires. When left unchecked a lack of self-awareness in these areas can be debilitating to your ministry and destructive to your life. The discipline of self-awareness is a leader’s intentional pursuit for self-understanding. 1. Cultivate friendships. With so many “one another” passages in the New Testaments, we understand clearly the early church teaching on the necessity of Christian Community. Early on in ministry, I received well-meaning, but ill-advised counsel, “If you are going to be the pastor, you really cannot have friendships in the church.” I am consistently surprised by the level of loneliness and lack of deep friendships found in pastors and planters. You cannot grow in self-awareness apart from gospel-centered friendships. How are you intentionally pursuing deep and meaningful friendships? 2. Invite someone to adjust your self-perception. This is a humbling assignment for three reasons. First, you are acknowledging your own propensity to see yourself in a favorable light. Second, you are inviting someone to critique you. Third, you recognize you are broken leader in desperate need of transformation. We can easily become blinded to what everyone else sees clearly. It is difficult to lead effectively when those you lead perceive you differently than you perceive yourself. Who has permission to adjust your self-perception? Sadly, because I lacked the self-awareness to understand how others might perceive me, the early years of ministry consisted of me justifying my passion and personality while leaving a wake of hurt and offended people. Pursuing the discipline of self-awareness calls us to look to Christ as our example as we deal with our character, feelings, motives, and desires. The fruit of healthy gospel-centered self-awareness will always be people seeing more of Christ and less of you. Do people see Christ in you? McNeal, Reggie. Practicing Greatness: 7 Disciplines of Extraordinary Spiritual Leaders (Jossey-Bass Leadership Network Series) (Kindle Locations 318-319). Wiley. Kindle Edition. You can download the Gospel Life Plan Worksheet and resources by clicking the link below. Don't miss out on an oppurtunity to commit your life and year to loving God, leading well, and living the gospel as you and your family manifest God's kingdom here on earth. the arrival of a notable person, thing, or event: the advent of television. the first season of the Christian church year, leading up to Christmas and including the four preceding Sundays. the coming or second coming of Christ. adapted from Tony Kummer, Ministry-To-Children.com Permission granted to make copies for non-commercial use. 1. Worship is about God. Family devotions are when you meet with God as a family. Don’t let the details hide the big point – you are gathering together to hear from God and respond to Him in love. 2. Make it important. You can make family devotions a regular and joyful part of your home life, but you must make it a priority. Don’t let time pressures rob your family of the eternal treasure of knowing God. 3. Keep it short. For most families, 15 minutes several times each week will work well. As your children mature, devotion time will naturally become longer. But regular short meetings are better than occasional long meetings. 4. Make it fun. Everyone should look forward to family devotion time. Use role-playing to act out Bible stories, or invent motions to accompany the singing. 6. Make it a habit. Getting into a pattern (or habit) will make family devotions a normal part of your home. 7. Learn as you go. Experience will become your teacher. Since every family is different, you will need to discover what pattern of family worship best fits your home life. 8. Involve your kids. Have you children lead in different ways and times. 9. Avoid distractions. Turn off the television and remove toys from the area. If you have small children, an illustrated story Bible will help retain their attention. 10. Model leadership and ask questions. Mom and Dad should be heavily engaged and involved as the lead their family during this time. Learn the art of asking questions. 11. Always include the cross and the tomb. Clearly communicate in light of the Gospel. Objectives for Every Family Concerning the Gospel and Christmas. 1. 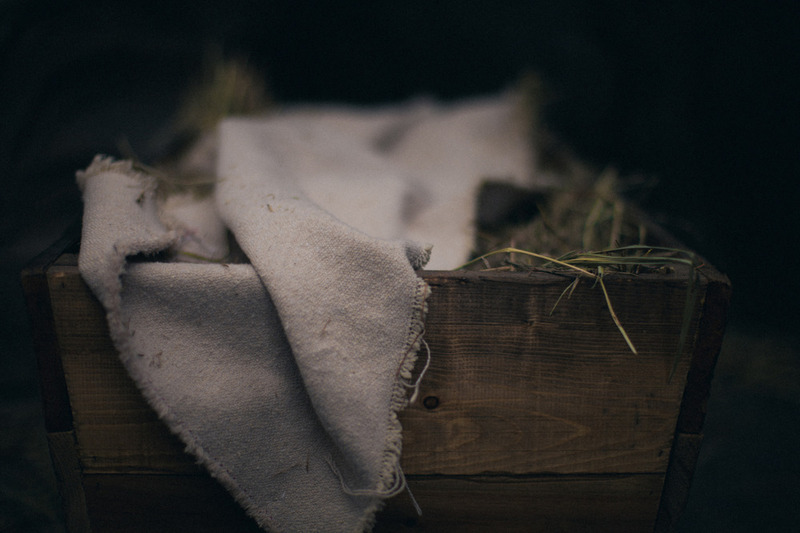 Teach clearly the Biblical story of Christmas and the Doctrinal meaning of Christmas. 6 For to us a child is born, to us a son is given; and the government shall be upon his shoulder, and his name shall be called Wonderful Counselor, Mighty God, Everlasting Father, Prince of Peace. 7 Of the increase of his government and of peace there will be no end, on the throne of David and over his kingdom, to establish it and to uphold it with justice and with righteousness from this time forth and forevermore. The zeal of the Lord of hosts will do this. 8 And in the same region there were shepherds out in the field, keeping watch over their flock by night. 9 And an angel of the Lord appeared to them, and the glory of the Lord shone around them, and they were filled with great fear. 10 And the angel said to them, “Fear not, for behold, I bring you good news of great joy that will be for all the people. 11 For unto you is born this day in the city of David a Savior, who is Christ the Lord. 6 who, though he was in the form of God, did not count equality with God a thing to be grasped, 7 but emptied himself, by taking the form of a servant, being born in the likeness of men. 8 And being found in human form, he humbled himself by becoming obedient to the point of death, even death on a cross. 2. Recognize the Worldview of materialism and consumerism; Beware of The Law of Unintended Consequences. consumerism: the preoccupation of society with the acquisition of consumer goods. 3. Model the example of Jesus and serve. 13 You call me Teacher and Lord, and you are right, for so I am. 14 If I then, your Lord and Teacher, have washed your feet, you also ought to wash one another’s feet. 15 For I have given you an example, that you also should do just as I have done to you. New Orleans, long known as The City That Care Forgot, is experiencing a resurgence in population, city life, young professionals, and immigrants. 11% of the population self-identify as evangelicals, there is great lostness here and great opportunities to reach this World City with the gospel of Jesus Christ. Contact me via gross@namb.net if I can serve you or your church in partnering in the gospel to reach New Orleans. 1. Military Plant in Belle Chase- NAS JRB New Orleans is one of two Joint Reserve Bases in the country that serve and house commands from various branches of the Armed Services. 2. Arabic Plants on the Westbank and Kenner- There is an estimated 10-15k Arabic People in New Orleans. We need an Arabic speaking planter and SENDING Church. 3. Hispanic Plant in Metairie- There is a large demographic of Hispanics in Metairie, we need a Hispanic planter and SENDING church. 5. African American Plant in East New Orleans- This location is in a primary blue-collar African-American neighborhood and needs an evangelical gospel witness. 10. Multi-Ethnic Plants in Kenner/Elmwood/Metairie South of I/10. For the past week I, along with 31 other workers from Ashland Avenue Baptist Church in Lexington, Kentucky, helped Lakeshore Church in New Orleans with community outreach. The main goal for our team was to canvas a few square miles around the church in order to increase awareness of the new church plant and to minister the gospel of Jesus Christ to the community. Overall, we secured 145 contacts of people that had at least a slight interest in the new church coming to their area. Most would be very pleased with this number and they should be. However, these weeks of intense canvasing before the launch of a church plant are often some of the most disorganized and fruitless because of the lack of a centralized system to later access all of the contacts made by teams. Groups of mission teams go out and make great contacts. They might even write some of them down. They have hundreds of stories about the lady at the end of the block who was so excited to be prayed for and asked for someone to come and drive her to the church when it begins. But when the team leaves, often, so do all their contacts. But there are a few great ways to remedy this problem. During this past week, Pastor George Ross had me set up some new church software for them that was capable of taking care of this problem and so many others that new church plants face. I chose SimpleChurchCRM. Simple Church is a program that allows for a very easy web/app based data entry. It can handle everything from online giving to mobile directories for the entire church. Watching other churches plant and reading about their difficulties, here are three of the most common struggles on the administration side of new church plants and how a program like Simple Church can be amazingly effective to alleviate the staff. Before the church ever launches, there must be a way to track money and to receive future tithes and offerings. Passing out a plate and counting it all up before you drive it back to the bank can lead to terrible mismanagement of the monies and creates a new problem in budgeting before there is a standard-monthly-earning achieved. A centralized church planning program allows for a lay-person to create expense reports, set up online giving, forecast budgets, and pay all invoices in one place without needing to spend limited resources on accountants. This is the most common problem and also the easiest to remedy. If you have teams canvas the surrounding area, give them the priority of getting the names and email addresses of everyone so that they can be entered into a group in the program. This information can be used to directly send follow-up invitations. Phone numbers and addresses are great, but emails are the most efficient way to follow up and organize further visits. The church calendar is a grossly over-booked mess in many new churches and even in established ones. But by implementing a software like Simple Church, one person can be placed as an admin on the calendar. The admin is the only person able to add things to it, but everyone in the church can have access to the calendar on their phone app. This does a few things: it keeps people from double-booking, and it lessens the work load for the staff by preventing them from constantly having to answer questions about the church calendar. Don't waste precious time and energy. Make it a priority to identify, purchase, and implement a church systems platform in your church plant. Partnering as a SENDING Church: Northstar Church, Saltillo, MS.
NorthStar started as a church plant in the spring of 2006 in Saltillo, MS. We set out from the beginning to be a multiplying church. Within the first three years, in a minor way, we supported a church plant in Huntsville, AL, Ignite City Church. As we approached our 10-year mark, the leadership of the church began to evaluate the past and look ahead to where the Lord is leading us. I knew it was time to take the next step in our involvement with church planting. I wasn’t sure what that looked like, who to support, or where to start but I did know we needed to be proactive in taking the next steps. I periodically receive email updates from the NAMB through SEND Missionary George Ross, about partnering with plants in New Orleans. In April of this year, I received another email about an upcoming Catch the Vision Tour and was encouraged to attend. I knew that would be a great chance to learn more about how we could partner with a church plant. April came, and I remember driving down with an open mind but still not knowing what we could do. The first night of the CTV everyone who was on the tour had dinner together, and three or four of the planters were able to join us. I had the opportunity to sit at a table with Troy Gause, a planter in need of a SENDING church. I was able to hear personally about his heart for the city and later that night we walked Jackson Square, in the French Quarter. Conversations are one thing, and anyone can talk a big game, but when you see their faith at work, it takes on a deeper level of respect and trust. Seeing Troy minister and relate to people on the streets that night gave me a glimpse of his vision for the church. The next day we toured the city and made stops to hear from a ten other planters in need of support. I heard each of their stories, and some were captivating. At this point, my heart was heavy not knowing who we should partner with and to what level. I got back home and shared with the leadership team of NorthStar as well as our missions team about the trip. We spent over a month praying and learning more about what was involved in being a SENDING and SUPPORTING church. We ultimately decided that we needed to follow the Lord’s direction and become the SENDING church for Troy and Cross Culture Community Church. This past Sunday we had Pastor Troy and his family share with our congregation about his church plant. The response was overwhelming! Church planting is hard work! If you are a part of an established church, understand that the work of planting a church from the ground up is extremely difficult especially in spiritually dark places. Be there to listen to their struggles. Encouraging the planter, his family and the members of the church help keep their eyes on the vision of what God has called them to do. It’s simple. It helps them know they’re not alone. Give like you never thought you could. You can get a clear picture of what your ministry focus is, by where the budget goes. If you don’t have a place in your budget for church planting, evaluate your ministries and see where you can reallocate funds for your church plant. Next year, put them in your budget. When you host a planter, be sure you are hospitable and take care of travel expenses because coming to your church may mean taking time away from work. With that in mind, take up a love offering or set aside an honorarium. Financial support is needed but don’t let that be what stops you from stepping out in faith. Kevin Ezell, president of NAMB, said, “Every church regardless of size can be a sending church. It has everything to do with engagement, not with money.” Think of creative ways you can bless the planter and church. Every church has resources they are blessed with, use those for his glory and trust the Lord will provide for the needs of your church. Be bold and exercise faith, as you take the next step in missional engagement. Not everyone can take 1-2 weeks off work to go overseas. But most can drive 5 hours or more for a weekend or 4-6 days to serve and meet needs of the church plant. Be sensitive to their schedule and plan accordingly – not just when it’s convenient for you and your church to go. We're still taking our first steps as a SENDING church - learning as much as we can so we can be diligent and faithful in seeing Cross Culture become a self-sustaining body who loves God, leads well and lives the gospel. Supporting Churches are essential for church planting to be fruitful. Church planting is far more difficult and dangerous when there are no supporting church partnerships. Healthy church plants will testify to the vital impact of supporting church partnerships in their journey to self-sustainability. A supporting church can partner with a church plant through prayer, participation, and/or provision. Today’s post highlights five considerations for supporting churches partnering through participation. If you are partnering or considering partnering, make it a priority to visit the church plant, preferably with a team of people from the partnering church. Understanding the context is essential for healthy partnerships. Seeing on the ground conditions will shape how you view and support the church plant as you lead your church to participate. What might be working for you in your context is probably very different from what will work in the church plant context. Be careful that you don’t highjack the ministry vision of the church plant by forcing the planter to conform to the ministry and vision of your church. Commit to learning about the mission and vision of the church plant, look for ways you can partner to make it happen. Have you ever had the cheap, cheap, cheap, red hot dogs? The ones that turn your hot dog bun and hand red? Don’t be the church that buys those for the Block Party because you are too cheap to spend an extra couple of dollars for some real hot dogs. Be as generous as possible and look for ways to cover all the ministry expenses when you are participating with a church plant. If you are using the church plant facilities consider leaving a financial gift to cover utilities and building usage. Plan to partner through monthly or yearly financial giving, this is a game changer for church plants. Pastor don’t be afraid to let your team stay over and worship with the church plant, even if it means missing a Sunday. Supporting churches can participate in a worship service by offering to serve in the nursery, preschool, and children’s ministry for the day. This will be a much-appreciated ministry for the volunteer staff of a church plant. If you want to go all out, suggest your team give their tithe/offering that week to the church plant. Take time to equip your team to have a “Yes” face attitude and testimony. This simply means being willing to go all out with a positive attitude as you seek to carry out the mission and vision of the church plant while giving your best visible “Yes” face. Church planters are always in need of encouragement, equipping your team to model a “Yes” face will have a tremendous impact for the kingdom and the planter. These are helpful ideas to consider as you participate in supporting a church plant. Faithful supporting churches participating alongside church plants are the most effective and biblical means to advance the gospel in hard to reach cities. Do not think for a moment you are just taking a trip or serving at an event, the participation of a supporting church has eternal impact you may or may not see this side of heaven. Click here for more helpful supporting church resources. This weeks guest post is by my wife Joy Ross, follow her on Twitter @joyleanne. I remember the first few weeks in New Orleans visiting churches. To my recall, I don’t think I’d ever visited a church in my life, well maybe on vacation as a kid! I’ve never had an option of where I would go to church, but then all the sudden I came to the realization of not being the preacher's wife, not being the preacher's daughter, and that I'm just a visitor, not a soul here will know me. As freeing as this might sound for some people, it was very hard for me. I remember lots of smiles, and several people said, "Welcome!" Even some said, "Nice to meet you!" I got my children situated in class and found a seat. Sometimes George was preaching somewhere else, and sometimes he was with me. When he wasn’t with me, I sat down alone. People walked by and visited with their friends, grouped together, and found their usual spots. No one purposefully was trying to make me feel bad, but I remember being alone and wishing someone would say to me, "come sit with me!" No one ever did, though. “Joy, never forget this moment. You will not be the new person for long, and you will make friends, but NEVER forget this feeling, LONILENESS! Don't be that girl Joy, that just walks by and smiles. Get out of your comfort zone! Ask people to sit with you, better yet just sit with them. People are hurting. You are not hurting Joy; you know me. Some of these people that walk into the church will never walk in again because while you were wanting to fellowship and speak to that same person you’ve texted all week long and will hang out this weekend, they sat alone, and you missed that opportunity to be me! Be JESUS Joy! Open your eyes, walk with me. This is for my glory and your good. That feeling right now. Don’t forget it, may it lead you to be more like me!" Here are five practical ways you can help visitors feel welcome and provide a pathway for connection. 1. Ask visitors that are alone to sit with you. Go above and beyond to make them feel welcome into your church body. Introduce them to others. If it’s a male, find a male. If it’s a college student, find a college student, if it’s a student, find a student (You get the picture. Be wise). If they are trying to find a ministry or looking for someone, don’t just point out where to go; show them, introduce them, talk to them, stay with them. Be a minister and make your smile count for the glory of the Lord. Your church should have some form of visitor card that is purposeful for collecting valuable information and prayer requests. Offer to help the visitor complete one and drop it off for them when they are done. We collect information and prayer requests because we care, not to add them to another list. Offer to exchange emails and give them your social media information. Point them to the social media platforms of the church and encourage them to visit the churches website for more information and ministry opportunities. Go to church with a mindset that many visitors show up on any given Sunday because they have found themselves feeling alone and in a hopeless situation. Followers of Jesus should be the most hopeful people on the planet, don't forfeit the opportunity to manifest living hope to those that visit your church. For the first time in my life, my sanguine-self remembered being very lonely. I wondered if this is what it had felt like to visit our previous church? I wondered how many times I had smiled and walked past someone with a well-meaning smile and nod. I asked the Lord to forgive me for the times I had been too busy to make a difference in the lives of just one visitor. Leading your church to engage in a prayer partnership is a great and essential first step in missional engagement. Church planting is difficult and lonely at times, and church planters are in great need of the most powerful resource you can offer, the prayers of the Saints. Implementing a strategic partnership with a church plant is a powerful way to partner with church plants as they spread the gospel and have kingdom impact. 1. Read and implement Serving In Your Church Prayer Ministry as Church Wide Emphasis. This is a great resource for laying a solid foundation for a Church Prayer Ministry. 2. Download a Church Planter Profile. Get to know the planter, his family, and ministry context. Print, distribute, and display these in your church. 3. Initiate a specific and regular time to pray for the planter you adopted. Regularly remind your church of their commitment, responsibility, and privilege to pray. Have them set their phone/clock alarms to the agreed upon time and stop and pray. 4. Assign Small Groups/Sunday School classes to adopt the planter and his family as they routinely write prayer cards on birthdays, anniversaries, holidays and special occasions. 5. Use quarterly video calls in a church wide service. Ask planters to share for 5-10 minutes followed by corporate prayer for the adopted planter, family, and church. 6. Google Earth the church planter’s geographic location and pray over his community addressing the needs, barriers, and lostness. 7. Send a team to pray “on site with insight” at the location of the planter’s community. 8. Use a monthly/weekly update to communicate the prayer needs of the planter you adopted. 10. Create a prayer chain that will commit to immediate prayer for real time ministry requests and needs the planter may encounter. These are just a few practical ways your church can partner with a church plant as you commit to battle for them through prayer. What a wonderful privilege it will be for you and your church to participate in meeting every church planters greatest need, having faithful prayer warriors interceding on their behalf. When is the last time you said thank you? Sending and supporting churches make church planting a reality. But the support they give can easily become expected or taken for granted. Planters and Missionaries can fall into a sense of entitlement, believing we deserve support for our ministry efforts and sacrifice in reaching the lost. Do not let this be true of you! Take the initiative and make the effort to thank those who support you. 1. Make writing thank you cards routine. There is a former church plant, now self-sustaining, that consistently write me thank you cards for my ministry investment in their staff and church. I am always encouraged and grateful to find their handwritten note in my mailbox. Keep a running to-do list for "Thank You" cards and mark out time on your calendar to write them. Taking time to send a handwritten thank you note is an expression of gratitude. Keep a list, mark out time on your calendar, and buy some stamps:) Writing "Thank You" notes should be a routine ministry discipline if you are a church planter. 2. Provide partners with something that connects them to your city and church. Connection Church Belle Fourche, SD is a church plant I pray for regularly because the planter gave me a great shirt and coffee mug. Every morning when I drink coffee in my Connection mug or when I wear my shirt, I am reminded to pray for this church and their staff. Don't miss out on the little ways you can connect your partners to your church and say thank you. Each city has something unique planters can use to say, "thank you" and join their partners to the city. In New Orleans, everyone has the privilege of experiencing "King Cake". Only after eating a Cream Cheese filled King Cake will you fully appreciate what I am saying. Many planters here send out King Cakes in January and February to their partners thanking them for their support. 3. Text a picture and thank you. Ministry is fast paced, and we can quickly lose sight of all the support that made it possible. The next time you host a block party, community event, or see someone saved and baptized. Take a picture and send a text to your partners with a little note that just says, "thank you for making this possible." 4. Send a book and thank you. I have a copy of Pray for The Flock by Brian Croft on my nightstand. A church planter here in New Orleans gave me a copy and wrote a lengthy personal note of encouragement. This was a special gift that not only reflected gratitude for my investment, but ministered to me greatly. These are practical and tangible ways to show your partners that you are grateful for their support and covet their partnership. It saddens me to hear a support church share experiences of ingratitude and entitlement from partnerships. Church planters make it a priority to show your gratitude for how God has a provided for your ministry by intentionally thanking those who support your ministry.